수도권의 통행패턴은 행정구역 경계와는 관계없이 시민들의 이동패턴이 실제로 어떻게 이루어지고 있는지를 보여준다. 서울 발생 및 도착 통행량 추이를 살펴보면 서울에서 경기지역으로의 통행도 점진적으로 증가하는 추세지만, 경기지역에서 서울로 유입되는 통행량은 1980년 서울도착 유입량의 7%수준에서 1997년에는 약 19.4%로, 절대수치에 있어서는 142천명에서 809천명으로 5.7배 가까이 증가하여 주거지역 광역화가 급속하게 이뤄지고 있음을 나타낸다. 서울로의 통근율을 공간적으로 살펴보면 서울중심지에서 반경 35-40Km권내 도시들은 서울로의 통근의존율이 점차 높아지고 있어, 이 지역은 실제로 하나의 거대한 광역 생활권을 이루고 있음을 알 수 있다. Commuting in the metropolitan areas show the actual movement of people, regardless of the administrative boundaries. Commuting in terms of departure points and arrival points, show that from Seoul to Kyonggido there is commuting and traffic volume on a gradual rise. However, commuting and traffic volume from the Kyonggi-do regions to Seoul increased from 7% in 1980 to 19.4% in 1997, or 14.2 million people to 80.9 million, which means there was an increase approximately at 5.7 times, reflecting a rapid residential area expansion. 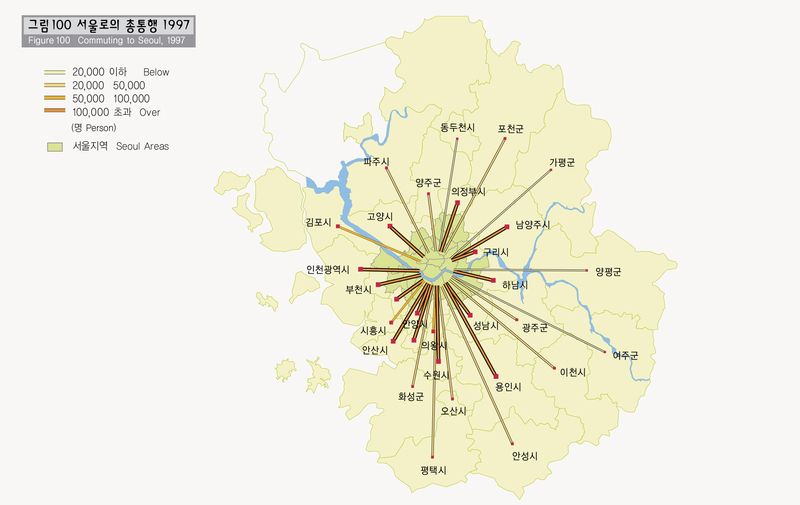 A study also found that the cities in the radius of 35-40km from downtown Seoul have a high rate of commuters, showing that Kyonggi-dos cities are within the one-day living sphere of Seoul.